The High Precision Series HM35 Digital Manometer is designed to reliably measure and log pressure measurements for critical applications. This family of manometer can measure absolute pressure, differential pressure or gauge pressure with up to 0.05% accuracy. The data logging function can store up to 10,742 readings and transmit the readings to a PC through an IR serial port. The large display can graphically display trends in the data as well as peaks and valleys. The series HM35 comes standard with a calibration certificate so that the instrument can be used as a secondary calibration standard when testing other pressure instrumentation. 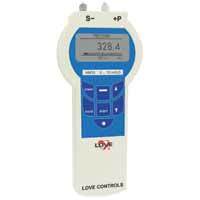 This manometer is ideal for laboratories, calibration facilities, and other critical pressure applications. Pressure Connections: Hose 4/6 mm or 1/8" NPT. Accuracy: (includes linearity, hysteresis, and repeatability) depending on Model: ±0.20% full scale ±1 digit; ±0.10% full scale ±1 digit; ±0.05% full scale ±1 digit. Humidity: Maximum 95% RH non-condensing. Display: Graphical Back Lit LCD, 128 x 64 points. Power Requirements: 3 x 1.5 VDC Mignon - Cell AA Batteries (included). Can operate on 6 to 9 VDC external power. Current Consumption: 25 mA without back lit display, IR, or buzzer. Memory: 10,742 readings. Recording intervals adjustable from 1 second to 24 hours or manual.